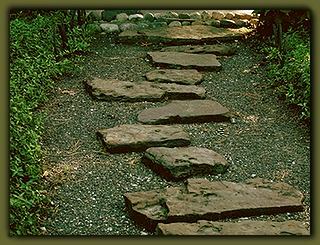 This stepping stone path is called a wild-geese design or gan-kake and is based on the flight patterns of geese. Groupings of 2 and 3 stones creates a rhythmical and natural direction toward the Arbor of the Plum Wind. Click on the image for a view of the pavilion.